Robot Revolution: Will Machines Surpass Humans? Machine vs. Man – Could It Happen? Data scarfing by BIG Tech, data sifting by BIG Gov, autonomous machines, smart phones, smart cars… Could it happen? Kyle Reese: The 600 series had rubber skin. We spotted them easy, but these are new. They look human… sweat, bad breath, everything. Very hard to spot. I had to wait till he moved on you before I could zero him. Sarah Connor: Look… I am not stupid, you know. They cannot make things like that yet. Kyle Reese: Not yet. Not for about 40 years. Most folks who read this blog are techies in some way or another. You all know the possibilities of current and near-future technologies. Have you ever wondered what lies ahead? Will something like SkyNet ever happen? Will Google’s massive server complex someday wake up and decide that it doesn’t need its masters anymore? How much is science fiction and how much is possible? Within thirty years, we will have the technological means to craft superhuman intelligence. Shortly after, the human era will be ended… Can events be guided so that we may survive? They’re just machines, right? We made them… our refrigerators, our industrial robots, our predator drones and autonomous tanks, our communication satellites. We control them. We utilize them to achieve our design goals. We make the machines. What happens when the machines start making the machines? It seems probable that once the machine thinking method had started, it would not take long to outstrip our feeble powers… They would be able to converse with each other to sharpen their wits. At some stage therefore, we should have to expect the machines to take control. I know technology. I’ve worked with it all my life as an electronics technician. I understand the underlying principles of digital computers, networks, security, etc. I also have some experience in the mechanics and electronic controls of robotics… a fascinating field, indeed. It has come a long, long way since I was working on small robot arms at a local trade college in the 80s. When it’s quiet in this room at night and all I can hear is the fans in the computer tower next to me on the desk here, I begin to wonder what will be sitting on this desk or in the corner of this room in 40 or 50 or even 10 years from now? How “smart” will it be then? Will it ever be smart enough to know that it exists as an entity in space/time? At that point, should that point ever come, what will determine its behavior? Programming from neurotic humans or programming from a smarter machine? How will a self-aware machine view the fragile bags of fluids and minerals that created them? What happens if/when those machines are part biological? Many questions, right? Things to ponder. I don’t have the answers. I’m just here to stimulate your late night thinking while you’re sitting there listening to the whir of those cooling fans in that box on the desk next to you. Could this rubber-skinned metal menace really haunt our future? If so, could human spirit, intelligence, and the same ingenuity that got us there also help defeat it? Makes one wonder, huh? We live on a placid island of ignorance in the midst of black seas of infinity, and it was not meant that we should voyage far. The sciences, each straining in its own direction, have hitherto harmed us little; but some day the piecing together of dissociated knowledge will open up such terrifying vistas of reality, and of our frightful position therein, that we shall either go mad from the revelation or flee from the deadly light into the peace and safety of a new dark age. 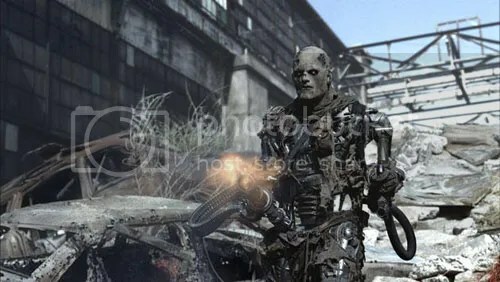 Image credits: T-600 Terminator from the movie Terminator Salvation owned by Warner Bros., used here under Fair Use rules with appropriate credit given. Memo: Many hyper-links in my articles point to further information provided by the free online encyclopedia Wikipedia. This wonderful resource is made possible by people like YOU. Please donate if you can. Every little bit helps. No. I’m not affiliated with Wikipedia, other than as an occasional contributor; I just think it’s a good thing… one that deserves our support.